A version of this article was originally published in the New Statesman. Two years after the riots, a tsunami-sized wall of cash is heading towards Morning Lane, a shabby thoroughfare in Hackney. The local council secured £5m from the Greater London Authority’s regeneration fund for areas affected by the riots and it is being spent on a project costing tens of millions and called the “Hackney Fashion Hub”. Fashion outlets, a café and design studios will be housed in two new seven- and five-storey buildings and 12 railway arches located opposite and adjacent to the old Burberry factory, which has attracted busloads of Japanese tourists since it opened as an outlet store in the 1990s. The developers are the Manhattan Loft Corporation, “the company who brought loft living to London” and whose recent projects include “67 of the most unique apartments in London, on the top floors of the Grade I-listed St Pancras Renaissance Hotel”. The architect is the trendy David Adjaye and work starts in 2014. As well as big-brand fashion salesrooms, the development will include design studios “where locals can show their work”. The stress is on the word “local” and the council is keen to persuade us that this project is not just to attract tourists and investment from the Far East. Hackney Council claims that the new hub will be physically integrated with and encourage visitors to go to “other areas of Hackney” (such as the betting shops and pawnbrokers on the Narrow Way) and “new signage” will encourage them to do that. But in reality it is separated from Hackney Central by the bus station on Bohemia Place, while retailers on the Narrow Way in central Hackney, a site of rioting, are excluded from the party. 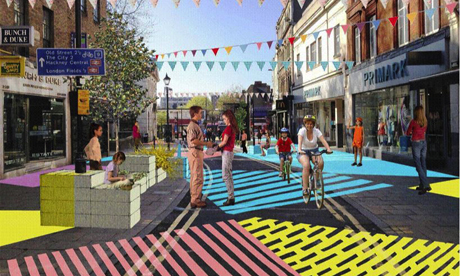 Hackney Council, who commissioned an artist to commission the image above, where forced to withdraw after local campaigners pointed our that it depicts and entirely whitewashed version of the street. Tags: gentrification. Bookmark the permalink.